Grab around 12 red potatoes. Cut each in half. 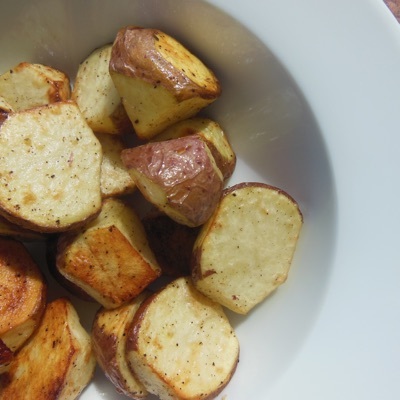 Place potatoes in a bowl or large Ziploc bag and mix with 2 TBSP of oil and generous amount of salt & pepper. Place potatoes on a baking sheet and put in the oven for 25 minutes, depending on how crunchy or not you like them. Shake the pan halfway through to roast evenly.